Tetsuo Ida studied at Department of Physics, the University of Tokyo. He studied under the supervision of Prof. E. Goto, one of the pioneers in computing. 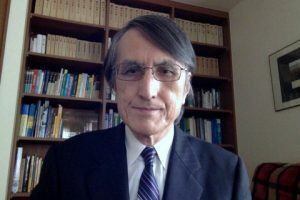 In 1975, he joined the computer science group of Institute of Physical and Chemical Research(RIKEN). There he worked with Prof. Goto in symbolic computation. One of the achievements of the research group was the construction of a computer called FLATS, a dedicated machine for symbolic computation. He worked on parallel hashing algorithms for symbolic computation and designed hashing hardware that was integrated to FLATS machine. Since then he has been active in many areas of symbolic computation research; semantics of programming languages, rewriting theories, and systems and algorithms for symbolic computation. He moved to the faculty of the University of Tsukuba in 1988. Since then, he focused on research in theoretical aspects of symbolic computation. He led a research group called SCORE (Symbolic Computation Research Group). He was one of the researchers who observed the importance of equational reasoning and solving in the design of programming languages for symbolic computation. He designed and implemented narrowing calculi for symbolic computation. The narrowing calculi are the engines of constraint functional logic programming language called CFLP, which his group developed in the 1990s. His research interest includes networked symbolic computation, declarative programming and rewriting until around the beginning of the year of 2005. In 2002 he started research on computational origami (paper fold), as an application of constraint programming and geometrical theorem proving. In particular, he studied origami from a constructive and proving point of view. His previous experiences with modeling programs by rewriting and developing symbolic computation algorithms led him to a successful integration of the knowledge about origami – folklore, that of non-standard geometry and traditional practice, into a consolidated system of origami fold/proving environment called Eos (e-origami system). The developments of Eos are continually supported by the grants by JSPS. He is also active internationally in organizing forums for symbolic computation and more broadly in software science and technology. He is one of the international founders of SYNASC, Romanian initiative to promote research in symbolic and numeric computing from its beginning. He has been working with Romanian researchers and Ph.D. students and published many papers with them. Together with Asian researchers in the field of programming languages and systems, he established Asian Association for Software Foundation (AAFS). He also contributed to the promotion of scientific exchanges between Japan and Tunisia.